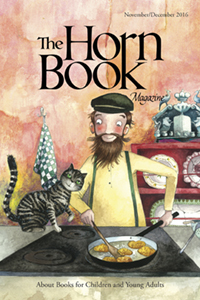 Original Content: In Case You Need Some Encouragement To Read The Latest "Horn Book"
In Case You Need Some Encouragement To Read The Latest "Horn Book"
I have Facebook/NESCBWI friends all over the November/December issue of the Horn Book. Saving Sisters: Little Women, The Hunger Games, and Frozen by Jeannine Atkins. Decolonizing Nostalgia: When Historical Fiction Betrays Readers of Color by Sarah Hannah Gomez. Wolf in the Snow by Matthew Cordell Review. An interesting twist on Red Riding Hood. Sleep Tight Farm: A Farm Prepares for Winter by Eugenie Doyle with illustrations by Becca Stadtlander. This sounds like Ox-Cart Man to me. I love Ox-Cart Man. Nanette's Baguette by Mo Willems. Willems does another book set in France. To Stay Alive: Mary Ann Graves and the Tragic Journey of the Donner Party by Skila Brown.Donner Party! I'm sorry. That was in bad taste. Donner Party! Cloud and Wallfish by Anne Nesbet. No one really knows their parents, but when they drag you off to East Germany before the Iron Curtain falls, you may not want to know them. This definitely doesn't sound like formulaic YA. By the way, the review was written by another Facebook friend. I like the NESCBWI Conference theme this year, so I hope there will be some workshops I'm interested in. If so, I expect to be there. Looks like a great issue - thanks for the head's up!